These extra large CR80 nameplates allow for 10 rows of text with 30 characters per row! Ideal for identifying your home-built aircraft with 4 rivet/screw holes. 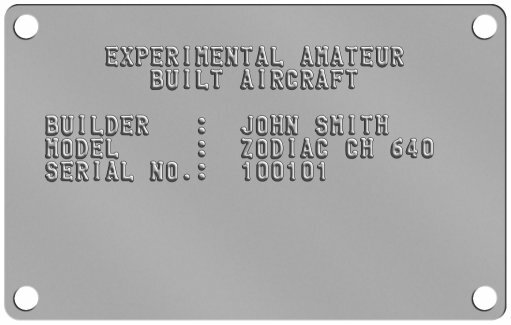 You are required to have a fireproof data plate on your amateur-built aircraft, but you are not required by regulation to have a data plate (or any identification) on your engine. The regulatory requirements can be found in 14 CFR Part 45, Identification and Registration Marking. Paragraph 45.1. The registration of homemade aircraft should indicate "Experimental Amateur Aircraft". The aircraft identification plate must be secured to the aircraft fuselage exterior so that it is legible to a person on the ground, and must be either adjacent to and aft of the rearmost entrance door or on the fuselage surface near the tail surfaces. 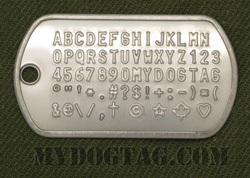 Customize to Buy your Aircraft ID Plates now! All orders are shipped within 1 business day and are usually delivered within 1 week (in North America). If you need any assistance creating or ordering your Aircraft ID Plates please contact us directly, we are here to help!